That children are our future is a cliché. It recognises the respect that children deserve. But the frequency with which the phrase is repeated suggests doubt about whether due respect is given practical effect. Some recent reports and documents confirm that doubt. They include the submissions made to the Victorian Commission for Children and Young People on the use of isolation in the Victorian youth justice system and its final report, reports and court evidence about the treatment of children in Barwon prison, the preliminary report by the Northern Territory Royal Commission into Child Protection and Youth Detention Systems, and an article surveying research into the extent of physical, verbal and sexual abuse of children in Australia. We need only to imagine ourselves as a child subject to the practices described in these accounts, to find them scarifying. The recurring images of children lying in the foetal position, a sign of acute traumatic stress, in solitary confinement, hooded or surrounded by guards say it all. When we set them against the results of research into the biological and psychological development of children sketched in the Commission for Children report, detention, prolonged lockdowns, isolation and a culture of punishment are destructive and counterproductive. The NT Royal Commission report echoes others in saying that decades of inquiries into the patterns and conditions of incarceration have produced few lasting results. Public concern is drawn to evidence of catastrophic brutality but ignores the underlying and persistent chronic dysfunction. The custodial treatment of people, however tightly regulated to ensure respect for those detained, inevitably drifts back to a punitive regime. We should then ask why public outrage at cruelty to children is only episodic, and why the compass bearings of detention regimes, however set to the true north of remediation, always swing back to punishment. Part of the answer may be found in the research estimates of the prevalence of abuse suffered by children. They differ widely, depending on the definition of what constitutes abuse, the composition of the group surveyed and the questions asked. Although the statistics are unreliable, on a conservative estimate they indicate that about one in 20 children have suffered emotional, physical and sexual abuse. This would mean that only a small minority of the friends and schoolmates of most children would be affected, and that their plight would escape adult attention. Where a higher proportion of young people suffers, as the research indicates in the case of young females, public concern is manifestly higher. "The resultant frustration of young people and the effects of a rapid turnover of largely untrained and underpaid staff will inevitably lead to protests and destructive behaviour. That can provoke either reform or repression." This may suggest that the treatment of children in the justice system does not arouse consistent public concern because, like Indigenous Australians, people who seek protection and Muslim Australians, they are a small minority. Most Australians will not have had much contact with them and so will not imagine them as like their own children. They will accept as justifiable for these different children treatment they would be outraged at if meted to their own. Only images that represent both these children's vulnerability and the brutality of their treatment will evoke in them empathy and outrage. They will see these other children as like their own. But when confronted with images of violent, uncontrolled behaviour by young people, they will again see them as alien and so properly subject to harsh and punitive treatment. This blinkered vision underlies the cycles of reform and regression to a punitive approach. It is also inherently likely that detention regimes will become more punitive. In any institution where one group of people is responsible for depriving other people of their liberty the interests of security will predominate over respect for the persons detained. The institutional relationship between the lockers-up and the locked-up colours the interaction between officers in centres of detention and those for whose incarceration they are responsible. The relationship between troubled young people and powerful figures of authority will be inherently conflictual. Detention will then be ultimately, fundamentally unproductive. The bias to the interests of the institution is also reflected in the priorities reflected in regulations designed to ensure respect for young people. In Victoria many regulations specify how young people in detention may and may not be treated. But another clause allows these requirements to be overridden when the interests of the centre are as stake. This statement of priorities inevitably mean that the respect due to the children is eroded, and that the regulations which limit the use of solitary confinement, exclusion and lockdown will become token. They will be seen as an exercise in ticking boxes and their intent ignored. The resultant frustration of young people and the effects of a rapid turnover of largely untrained and underpaid staff will inevitably lead to protests and destructive behaviour. That can provoke either reform or repression. In today's fearful society, unfortunately, repression is all the go, with new jails the kindergartens for forming future criminals. That will lead to another scandal, another inquiry and, we might hope, to another opportunity for reform. 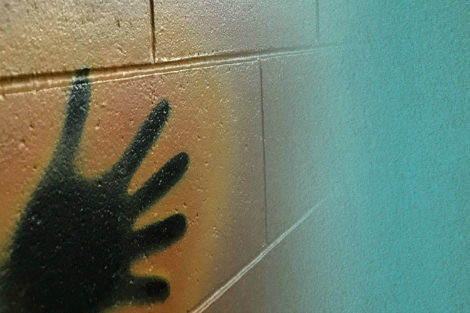 Main image from the website of the Royal Commission into the Protection and Detention of Children in the Northern Territory. When we think about young people who display challenging behaviours and who do not fit a criterion for full acceptance as a valued member of society, our thoughts, if we are sensitive enough, should focus on our own shortcomings. Harsher regimes and punishments do not reverse the predicament of assisting the proper functioning of this most valuable human being and leaves the young offender even more vulnerable to misadventure. Sooner, rather than later, every person of integrity will have to ask themselves "By depriving someone with so much potential of understanding, what am I losing?" My answer would be: a common love of impersonal justice. I don't have the answers but the so called 'therapeutic model's does not work. We live in a society where parents are not allowed to parent and then we wonder why these children turn out the way they do. I believe Tony has hit the nail squarely. Heaven forbid that we should imagine people, young or old, are responsible for their actions. Society has insisted that both parents work in order to pay a monthly fee to a bank or property investor. So children are passed to childcare centres or schools which tell them how wonderful they are and not to worry about algebra. These problems were much less prevalent when parents were encouraged to parent and teachers to teach. Many of these children are diagnosed, and some undiagnosed, with special needs. Examples: hearing deficits are a very real problem and of course Dylan was diagnosed with ADHD. Do we punish them or assist them? It is in the interests of society to remember that punishment is not a clinical cure but is likely to create a path to social disorder and then adult prison. Are these "children" the same as those who smashed up their previous accommodation in Parkville; who rioted in Geelong prison; who were hardened violent criminals on the outside; who rioted through the Melbourne CBD? These guys were destroyed as potential functioning young citizens over the first decade or so of their lives; what we are now seeing is a severe symptom of being badly messed up. Now, they just have to be tightly controlled for their own safety and for everyone else`s in the prison system. They may well be an irretrievably damaged cohort, in spite of very well-intentioned pleas "to do something". Seems to me to be rather late. But why did they end up like this? Surely we can do something to stop the same thing happening over and over again to groups of outer-metro kids? Whatever it is is relatively new, and might therefore be reversible; please God. It seems CCTV cameras have been the most effective reform so far. If abuse happens when the cameras are watching, imagine what would be happening without them and how hard it would be for abuse victims to be believed. Whether to have targets or quotas is a hard question to answer. Quotas have been employed by several European countries to great effect. But in Australia companies are encouraged to set themselves targets, which are optional. Businesses are moving towards targets at a glacial pace, with women in senior executive roles increasing by 2 per cent per annum since 2012. As long as it is up to businesses to create a diverse workplace, they need to put in the effort. Friday 5 May is the 25th birthday of the introduction of mandatory detention in Australia by the Keating government. It is by no means a 'happy birthday'. Rather it is a sombre reminder of how control, power and political vilification can be used for political ends. There are now more sections in the Migration Act dealing with statutory bars, mainly directed at asylum seekers, than the total number of sections in the whole of the Immigration Restriction Act of 1901.